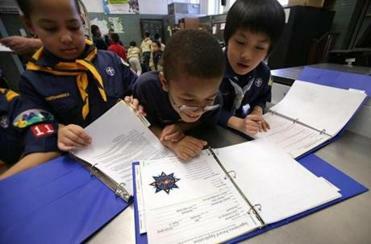 Derek Thach, 9, of Dorchester’s Pack 11, at the Mather School. In the school cafeteria, the young boys of Pack 11 have planted the stars and stripes and the pack flag in smallish stands, recited the scout oath, and now the cubmaster has silenced an excited din to present a new kid with a crisp Webelos shirt. To applause and whoops, the boy wriggles into a shirt that seems twice his size. It is Norman Rockwell stuff, a scene reenacted by generations of boys. But it almost always took place in small towns and suburbs. This was in the heart of Dorchester, where few faces are white and Scouting was all but unheard of a few years ago. 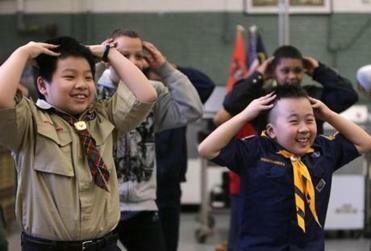 Now, after a major campaign by the local division of the Boy Scouts of America, there are more than 700 boys in roughly 25 Cub Scout packs in Dorchester, Mattapan, and Roxbury. In a surprise to everyone, boys are flocking to it. The urban retention rate is 60 percent, just 10 points less than in the suburbs, which means city boys are beginning to make their ascent from Cub Scout to Eagle Scout, the highest rank. Scouts played a game in unison Friday. One of Scouting’s biggest hits is the new rewards points system program. The change began after The Boston Minuteman Council noticed a growing racial disparity in its ranks and a dearth of urban Scouts when it analyzed the ZIP codes of its then 6,500 members. The council hired an urban coordinator, waived the annual $15 registration fee, and asked schools and community groups to offer space for meetings. The effort appealed for Cub Scouts, boys ages 7 to 10, who officials believed would be more receptive to the idea of Scouting and participating in activities with their parents. The initiative, called ScoutReach, got off to a rocky start. Skeptical parents were slow to get involved. Schools were unsure if students would be interested. Even the new urban coordinator, who had no experience with the Scouts, had to start from scratch in neighborhoods where Scouting is unfamiliar. But it quickly caught on. For generations, Boy Scouts has been a rite of passage. The organization nationally has also been hit hard by scandals, including allegations of molestations by adult leaders. Alana Hylton, the new urban coordinator in Boston, said the effort to boost Scouting membership is finally getting buy-in from parents and the larger community who want to do something good in their neighborhoods and want to see the Cub Scout packs thrive. One of its biggest hits in the initiative is the new rewards program, which instituted a points system to teach the boys the A-B-Cs of Scouting — attendance, behavior, and Cub Scouting. Boys perform activities such as attending weekly meetings, memorizing the Cub Scout promise, and increasing their physical activity from week to week. If parents get involved and attend an event or register as a leader, they get more points, which they can use to get such things as uniforms, neckerchiefs, backpacks, or a week at Camp Sayre, the local Scout site in the Blue Hills. The boys bond and look out for one another, she said, noting that one boy who used to fight and bully others at school is calmer and seems to be learning from others in his pack. Another boy said he was shy and had a hard time speaking in front of groups but that he is doing better with the quiet encouragement of the group. Isiah Pires (left), Kyre Ambrose, and Kerry Nguyen looked over documents together during their pack meeting. In Pack 11 recently, some boys did not have enough points to get uniform shirts, and others gave up their own points to get shirts for everyone in the pack. “That took heart,’’ said cubmaster Robert Cline, who travels each week from Marshfield to pack meetings at Mather Elementary School. Pack 11 now has 60 members, the most of any new pack in Boston, and is closer to being financially self-sufficient. Some of the boys were picked to join the Scouts’ new science, technology, engineering, and math camp next month. 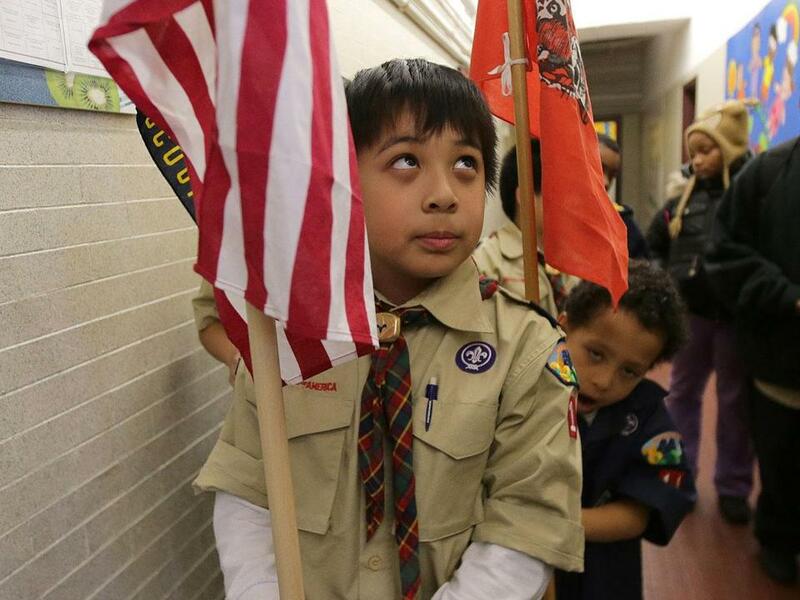 At a cafeteria table at the recent meeting, two talkative 7-year-olds, Isiah Pires, who lives in the Bowdoin-Geneva section of Dorchester, and Jeremy Tran, also of Dorchester, conferred with another Scout about their love of Scouting. They like the field trips, the friends, and earning points. When asked what they thought about the points system, they sighed loudly and put their hands on their cheeks. “People are counting on you. People are proud of you, and you don’t want to let them down,’’ said Tran, cherub-cheeked with an infectious smile. The three boys all wore navy Cub Scout uniforms with colorful neckties around the collar. The other two boys’ eyes widened with wonder, as they, too, wanted their Pack 11 shirts to be as decorated.